As Fall comes along and the weather gets colder, I tend to follow the "raw until dinner" rule pretty often. When I go for that option, the day is made up of fruit, green smoothies, and a few dehydrated goodies, and dinners tend to be any kind simple cooked veggies with the occasional tempeh. I've mentioned before that I tend to get a little bit obsessed with certain foods and eat them every day for a month until I move on to something new. This month, I figured why limit myself? So I took all of my favourite meals from over the past few months and put them into one. 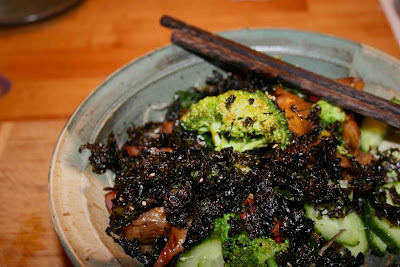 The result was this amazing kelp noodle bowl that I created a couple days ago. It pieces together all my favourite cooked and raw foods all into one giant bowl of yummy.